This is a small-ish (477 mm x 359 mm x 88 mm, 3.4 kg) MIDI controller (as in no sound generators, only MIDI) with 25 normal size "semi-weighed" synth keys. There are also some pads and knobs and switches as well as single input ports for one footswitch and one continous pedal. This probably accept common keyboard pedals. The advertising material rarely mentions it, but the keys are velocity sensitive as are the pads. There is a single aftertouch ribbon sensor for the keys and individual force sensors for the pads. Pads are criticized for being unresponsive, spongy, and still prone to false triggers. There are some replacement pads available as well as many Youtube videos about them. According to "midi IO details" pdf, the first carries 16 channels with the controller keys, pads, buttons, knobs etc on them. The LCD might show A/B output activity when connected to USB. Output A should be this (first) port. 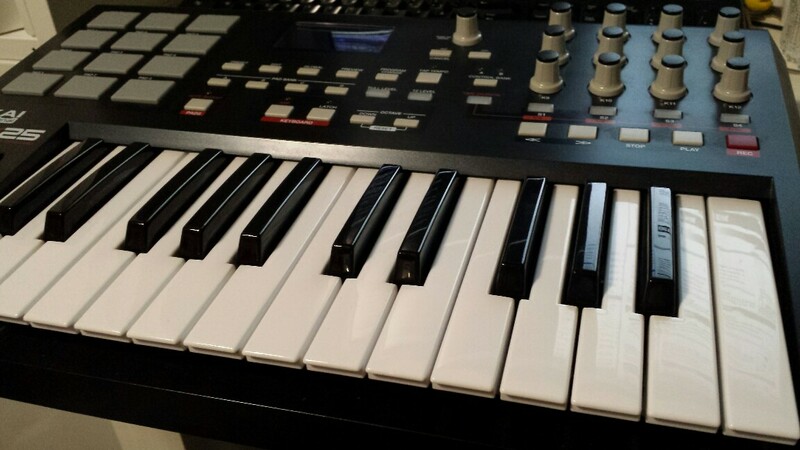 The second carries MIDI Output B. 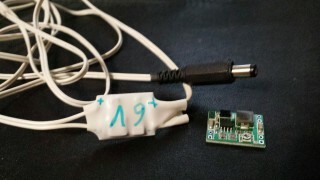 The third USB output device should repeat messages from the MIDI IN connector. Likewise the second input device mirrors MIDI OUT connector. For getting ALSA MIDI devices to appear in Jack (jackd2), a2jmidid seems to be recommended. Use -e to export hardware devices. You'll see them appear in e.g. qjackctl. It can be added as a startup script (a2jmidid -e &) in the config. Ardour3 MIDI track switch matrix will also show them by sensible names. 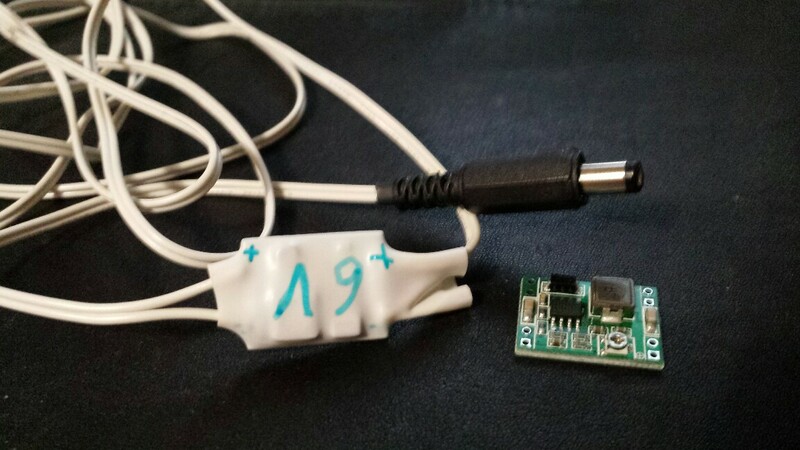 Quick and dirty 6V "bump in the wire" adapter. Solder together, dial pot to suitable voltage, hot glue the pot and wires using hot air and shrinkwrap with same. Manual says it will not send on MIDI OUT if powered via USB. The MIDI OUT instead echoes MIDI data sent from USB host and the controller pretends to be a simple USB-MIDI bridge. Also, only port A messages will be sent to the MIDI OUT connector. If USB is not used, MIDI IN connector will also be entirely ignored. I wanted to use MIDI out from the keys, so I needed the 6V option. I hacked together a 6V regulated cable with a 2.1mm DC jack to power the Akai.